Some people think an EMBA is only for people who want to advance their careers, not for people who already have, but John Terrell knows differently. 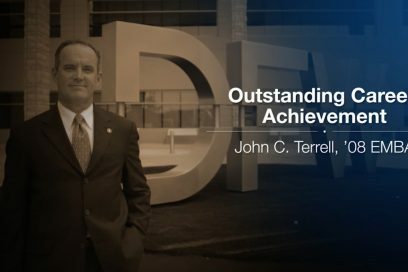 In fact, when he decided to pursue an EMBA in 2007, John was already the vice president of commercial development at DFW Airport and a member of the Southlake City Council. When people asked him, “Why do you need an EMBA?” he brushed it off, saying, “You’ll see.” And see they did! Using the same competitive spirit to find the right EMBA as he did to move up the ranks at DFW Airport, John began his program search with a list of considerable must-haves. The right EMBA had to offer more than book learning; it had to provide real-world collaborative experiences that could be applied right away. It also had to offer a convenient schedule, a robust opportunity to network and a China trip that was truly business oriented, not a sightseeing excursion. The China immersion program was equally relevant to John’s work in his development of a sister program between DFW Airport and several Chinese airports as well as a sister relationship with the City of Southlake. But the value of the EMBA program did not stop when John graduated. In fact, he still talks to his former teachers and even the dean for insights from time to time. What’s more, John believes that “nothing worth getting comes easy” and so, after graduation, he added another position to his resume: mayor. John campaigned for mayor of Southlake while he was finishing his EMBA studies, working full time and raising a family. Coincidentally, another student from his UTA EMBA graduating class was also planning a mayoral run, and both he and John won their respective races. Now that’s beating the competition.